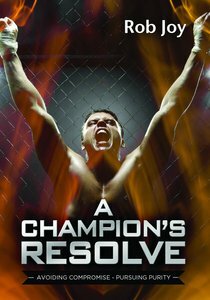 Following on from his first book, Internal Revolution, A Champion's Resolve offers grace and inspiration to not only be victorious, but to help others in their own walk with God. It's a very transparent account of a modern man's pursuit and passion to live a pure life, set apart for God. Containing personal testimony backed up by solid Bible teaching it serves to ensure the reader never gives up their own struggle, creating a 'Champion's Resolve'. 'With the courage of a cage fighter Rob Joy attacks the spiritual forces that have the potential to rob the Christian of their effectiveness and faithfulness. This book is raw, powerful and penetrating - which is what we would expect from someone who has been radically transformed by the power of the Gospel and longs to see others as impacted by the grace of God as himself.' John Glass, General Superintendent, Elim Pentecostal Churches. Rob Joy is a passionate evangelist, speaker and author. He is founder of Storming the Nations, a ministry committed to seeing a social and cultural change in the UK for the glory of God. He is married to Lydia and they live in the South of England.